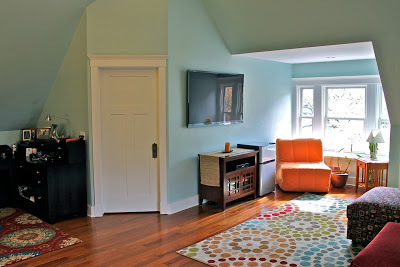 Attic renovations are some of the most unique and creative remodeling projects we work with. Often an attic will need more than just a cosmetic lift. Because many homes in Madison are older, the attic can also require structural improvements. 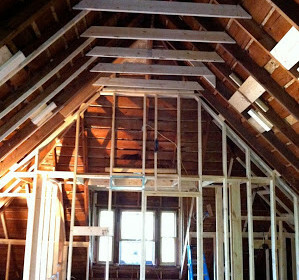 This is a great vantage point to understand what goes into an attic remodel. This old house needed a lot of structural repairs and strengthening. We analyze every home to uncover issues that need to be addressed in a renovation. We don’t want to just make the home look good, we want everything to be sound from top to bottom. After re-framing the floor completely, the walls and ceiling were vented and then sealed in foam insulation. Once the foam was done the rafters were filled with a cellulose insulation which made the new attic warm in the winters and cool in the summer. In addition the old 5 story chimney was removed to create a chase for new heat and AC to run to the attic. The space is now a comfortable and functional space acting as a guest suite, office and play room. Every home has huge potential for improvements and opportunities to enhance your lifestyle. We love uncovering these opportunities and bringing them to life.